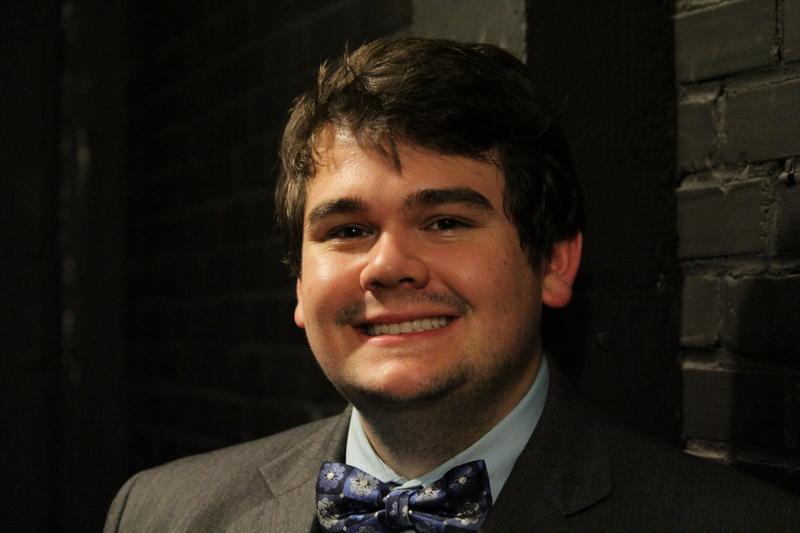 Bob Evans, former intern and current staff member at the Florida Division of Cultural Affairs. I have this theory. The kids who dream about growing up and becoming astronauts, ballerinas, or other such fantastic professions usually end up as accountants or telecommunications network engineers. Not to say that those aren’t fantastic jobs, but to the average American eight-year-old, it’s much more accessible to imagine space or the stage. But the kids who shoot for, say, architecture or constitutional law might end up being astronauts, ballerinas, or…arts administrators? Ok, it’s a little trite, as far as theories go. All this to say I never would have pictured myself as a musician, let alone an arts administrator, let alone working for Florida’s state arts agency. I moved to Tallahassee to pursue an arts administration degree in the Florida State University’s College of Music, and, along the way, I somehow impressed someone enough to be invited to join the Division of Cultural Affairs as an intern. I’ll be the first to admit to pretending I know more about the various branches and tendrils of state and local government than I actually do (with apologies to my dear, sweet, high school AP Government teacher). I understood that a state arts agency was typically a grant-making organization, but I had no clue how it functioned under the purview of state government. After seven months here at the DCA, I can assuredly say that it is just as complicated as expected but more wonderful than I could have imagined. My duties include running for coffee, picking up dry cleaning, driving people to the airport…no, that’s wrong! All throughout my internship, I’ve been treated like a staff member, and given just as many responsibilities. I’ve worked with the Florida Artists Hall of Fame and seen firsthand the wealth of artists that promote and preserve Florida’s culture. I’ve helped organize Florida’s Poetry Out Loud contest, under the guidance of the recently retired Ken Crawford. This program, sponsored by the National Endowment for the Arts and the Poetry Foundation, encourages high school students to memorize and recite poetry by truly great poets. These students learn how to perform on stage, and by memorizing a poem, they internalize it, which is such an under-appreciated skill in today’s world of instant access. Along with my brilliant colleague Tim Storhoff, I co-author a monthly review of arts and culture events in Florida, titled “Culture in Florida” after the motto “Culture Builds Florida,” which we post at the end of each month on this very blog (shameless plug: check out March). 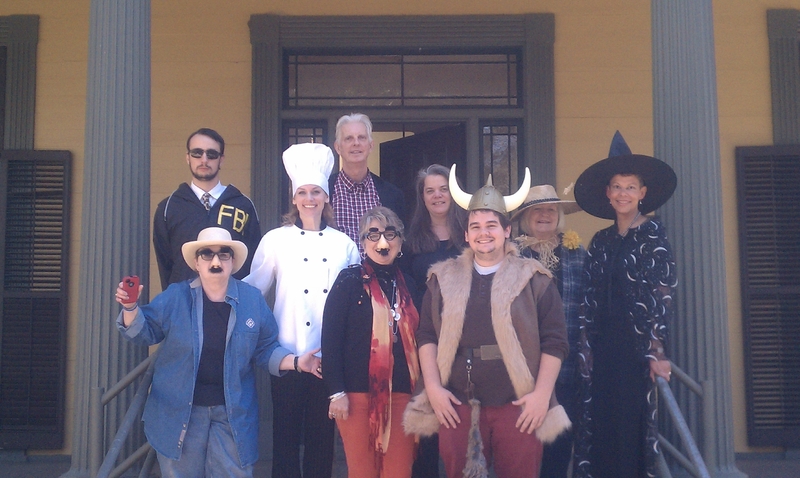 Florida Division of Cultural Affairs staff members in front of the Brokaw-McDougall House on Halloween. By far, the most heartening part of the job is reviewing reports where an individual or organization has received a grant of just a few thousand dollars and created inventive programming that is not only artistically resonant but engaging to a community. In those moments, when I realize what we’re doing at the DCA is directly impacting someone’s quality of life, I’m sure that this is what it’s all about. That’s the it. Recently, due to my keenly honed ability to be in the right place at the right time, I was offered a part-time position working with Individual Artist Fellowships here at the Division. I can’t believe my luck! I’m getting paid to do what I love, and this blog post gets a happy ending after all. This entry was posted in Florida Division of Cultural Affairs and tagged arts administration, Bob Evans, culture builds florida, Florida Artists Hall of Fame, florida division of cultural affairs, florida state university, florida state university college of music, Poetry Out Loud by culturebuildsflorida. Bookmark the permalink.